Quitting her husband's house and moving back in with her horrible family, Lady Maccon becomes the scandal of London season. Queen Victoria dismisses her from the Shadow Council, and the only person who can explain anything, Lord Akeldama unexpectedly leaves town. 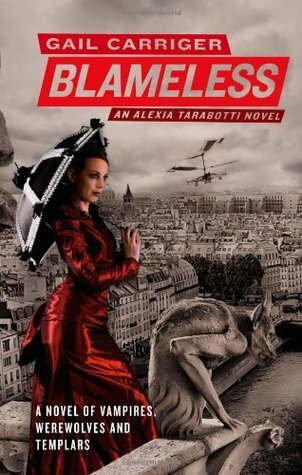 To top it all off, Alexia is attacked by homicidal mechanical ladybugs, indicating as only ladybugs can, the fact that all of London's vampires are now very much interested in seeing Alexia quite thoroughly dead. Recap! In Soulless (Bk. 1) we meet Alexia, a preternatural who has the ability to silence the power of supernatural creatures like vampires and werewolves. Alexia uncovers a secret club of dastardly scientists known as the Hypocras Club who want to rid the world of supernaturals. She also falls for, and marries, Lord Conall Maccon, the head of the Bureau of Unnatural Registry and alpha of the Woolsey werewolf pack. In Changeless (Bk. 2) Alexia and Conall are married, and a mysterious force is stealing the powers of supernaturals across certain sections of London. Through a series of family tragedies and mishaps, the couple find themselves in Scotland, Conall's homeland, fighting an ancient relic and a very angry wolfpack that wants nothing to do with their former lord anymore. And now for Blameless (Bk. 3). Alexia unexpectedly finds herself pregnant which she believed to be impossible since she has no soul and her husband is a werewolf. He too believed it to be impossible and decided the only explanation was infidelity, so Conall banishes her from the pack. Determined to prove her husband wrong, Alexia travels to Italy in search of the Templars who hold ancient wisdom. But no one is exactly who they seem. While still stubborn and fierce, Carriger starts to show Alexia's vulnerability in book three. While not overly excited about her pregnancy, she finally has to come to terms with the fact that she does, in deed, love her husband. There wasn't quite as much Lord Maccon or Lyall as I would have liked, but the story continues to move forward in fun, hilarious, exciting ways. And there's the kicker. Carriger is pretty darn funny. It's often a subtle humor, but it's there, and it's awesome because you really come to care for all of the characters. Even Ivy, Alexia's hat-loving, flighty friend. The dialogue is snappy (and better enjoyed read with someone with a British accent). Yesterday I talked about books that are great for escape. This series is a perfect example. And it's well-written. Join in the fun and pick up Gail Carrier's Parasol Protectorate series!